The ban on GM crops by European countries should be reassessed, the president of UK science body the Royal Society says. Prof Venki Ramakrishnan said the science of genetic modification had been misunderstood by the public and it was time to set the record straight. He said it was inappropriate to ban an "entire technology" and products should be assessed on a case-by-case basis. But opponents say GM crop technology is untested and the ban should remain. Prof Ramakrishnan said that the blanket ban on GM crops by European countries was misconceived. His comments coincide with a guide published by the Royal Society, which describes itself as the UK's independent scientific academy, for the general public. "GM is simply a technology for introducing a particular set of traits into a plant. And you have to decide on a case-by-case basis which of those traits are appropriate or not," he told BBC News. "You should regulate each product, which should be properly tested for its health and environmental effects." GM foods are not on sale in supermarkets and nor are they commercially grown in Europe for human consumption. 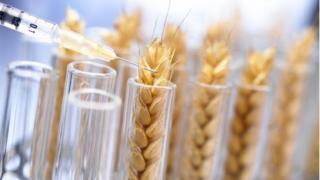 Are GM crops safe to eat? Could they harm the environment? In the long term, could there be unexpected and untoward side-effects? The answers have been produced by an expert group of researchers who have drawn on evidence from scientific studies. The answers acknowledge areas of uncertainty and some of the technology's drawbacks. The guide's stated intent is to provide clear, unbiased information on the science of GM crops. It states that GM crops are safe to eat, though it acknowledges that they can cross breed with non-GM varieties and there might be unexpected and untoward side-effects. Prof Ramakrishnan acknowledged there were some "legitimate worries". One he said was the fear that a small number of multinational corporations would monopolise food production. This could in turn lead to the loss of thousands of varieties of fruits, vegetables and cereals unless the technology was properly regulated. "We should not conflate the issue of GM's reputation with its potential," he said. "I hope the whole thing gets put on a more rational footing. "With a growing world population - with a projected need for 50% more food by 2050 - I don't think we can afford to give up on useful technologies especially to help poorer countries have a reliable and nutritious source of food." In a statement, the Soil Association said it believed that the Royal Society guide was neither neutral nor unbiased as it claims. "Everyone knows that there are at least some scientific controversies, and disagreements about evidence concerning GM crops. None of these are mentioned in the Royal Society document," the statement read. "This may not be surprising, given that there are no scientists who have consistently expressed scepticism about the application of GM technology to agriculture listed among the authors. "Scientific enquiry normally proceeds by open discussion of disagreements about evidence - the Royal Society's involvement in GM has been consistently one-sided, ignoring scientists with dissenting views, and overlooking facts which do not fit with the views of supporters of GM crops." An analysis of 900 pieces of published research into GM technology by the US National Academy of Sciences concluded that GM food was safe to eat - though it did highlight some environmental concerns. Prof Ramakrishnan said he recognised that the answers in the Royal Society guide would not end the controversy. "But we hope that they will inform people about the science and allow those who might previously have felt excluded from the discussion to form a view," he said. The Royal Society will hold a series of public panel discussion events (Growing tomorrow's dinner - should GM be on the table?) across the UK during the summer and autumn.